A representative of Far and Wild Safaris will collect you from the O R Tambo International Airport or from your overnight accommodation in Johannesburg and travel through the Highveld industrial, mining and agricultural areas. Our guide will make this section interesting, adding value with his interpretation of the local history and sights. The scenery is pretty flat but changes as we approach the Drakensberg Escarpment, where we drop down to the Lowveld through scenic passes. We head directly to the Kruger National Park. The world-renowned Kruger National Park offers a wildlife experience that ranks among the best in Africa. Established in 1898 to protect the wildlife of the South African Lowveld, this national park of nearly 2 million hectares is unrivalled in the diversity of its life forms and a world leader in advanced environmental management techniques and policies. We will spend our night in Kruger in bungalow accommodation inside the Kruger Park. Although not graded, these bungalows are of a two or three star standard. Here the rooms have twin beds, each with a private shower, toilet and hand basin en-suite. The brick under thatch rooms are equipped with air-conditioning, some also with ceiling fans and a fridge. There is insect proof screening on the doors and windows. You will be provided with bath and hand towels as well as soap. In the game reserve we will have breakfast and dinners in the restaurants. We enjoy a full game-viewing programme for the balance of the day. Your guide in his vehicle conducts the game drives. We encourage an early start to make the most of the best time of day to view the animals. We will try and be the first one out at dawn - this to see if we are able to sight some of the nocturnal predators returning to their daytime resting place and then to have breakfast, possibly at a different locality. We enjoy a full game-viewing programme for these two days. Your guide in his vehicle conducts these game drives. We encourage an early start to make the most of the best time of day to view the animals. We will try and be the first one out at dawn - this to see if we are able to sight some of the nocturnal predators returning to their daytime resting place and then to have breakfast, possibly at a different locality. After our morning game drive and breakfast in this very productive private game reserve, we leave the Sabi Sands Reserve and drive through to reach Johannesburg in the late afternoon or the O R Tambo International Airport in time for your flight. The private game reserves in this itinerary can be either the Sabi Sand or the Timbavati, or the Concession Lodges within the Kruger Park itself, which between them have a total of sixty-one lodges! Situated within the Kruger National Park itself are sixteen exclusive private lodges, with a unique style and atmosphere, is where luxury is the order of the day. These lodges will sometimes do their game drives on the public roads in the park, and they also have to abide by the general rules for the public, such as not being permitted to drive off-road for example. However, they are not bound by “gate times” so their morning drives are normally on the roads before the public camp gates open and they stay out later, until after dark. On the exclusive concession areas (to which the general public are not permitted), they do go off-road if the sighting warrants this. The Sabi Sands Private Game Reserve, with its thirty-three lodges,is renowned for having the best “Big Five” game viewing in South Africa, if not the world. Nowhere in South Africa will one find a wildlife experience quite like the one experienced within the Sabi Sand Reserve. Sharing a 50km unfenced border with the Kruger National Park, this immense (65 000 hectare/ 153 000 acre) and diverse tract of land is home to The Big Five (lion, leopard, rhino, buffalo and elephant), and much, much more. Two perennial rivers supply the game reserve with a valuable water source. The Sand River flows through the reserve for 50km (31 miles) from north-west to south-east whilst the Sabie River flows on the southern boundary. The sustenance of these rivers ensures that this area enjoys one of the highest and most bio-diverse wildlife populations of any area in South Africa. Over two hundred different species live in abundance, whilst the ever-changing bird life provides even the most experienced ornithologist with rare finds. Such is the environment that the wildlife, save for the migratory birds, remain in their territories all year round. Wildlife viewing here is second to none. 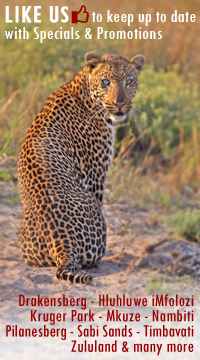 The Sabi Sand Private Game Reserve enjoys good quality viewing of leopard (the most elusive of predators), as well as elephant, lion, rhino, leopard, buffalo, cheetah, giraffe, zebra and a vast variety of antelope and other species. In fact, a checklist of the reserve would yield no fewer than 330+ tree species, 110+ reptile species, 500+ bird species and 145+ mammal species, all occurring within their own natural environment. The Timbavati Private Game Reserve, with its twelve lodges, is situated just north of the Sabi Sands, is renowned for having very good “Big Five” game viewing and enjoys good quality viewing of leopard (the most elusive of predators), as well as elephant, lion, rhino, leopard, buffalo, cheetah, giraffe, zebra and a vast variety of antelope and other species. In fact, a checklist of the reserve would yield no fewer than 330+ tree species, 110+ reptile species, 500+ bird species and 145+ mammal species, all occurring within their own natural environment. They too share an unfenced common boundary with the Kruger National Park.